Infants born prematurely have low levels of antibodies, substances in the bloodstream that help protect against infection. In the later part of pregnancy, antibodies cross the placenta from the mother to the fetus. When a baby is born prematurely they miss out on this immune system boost of protective antibodies and therefore, their risk for developing infections is higher. Preemies are more susceptible to infections because their immune system is immature and therefore it is harder for them to fight off germs effectively on their own. 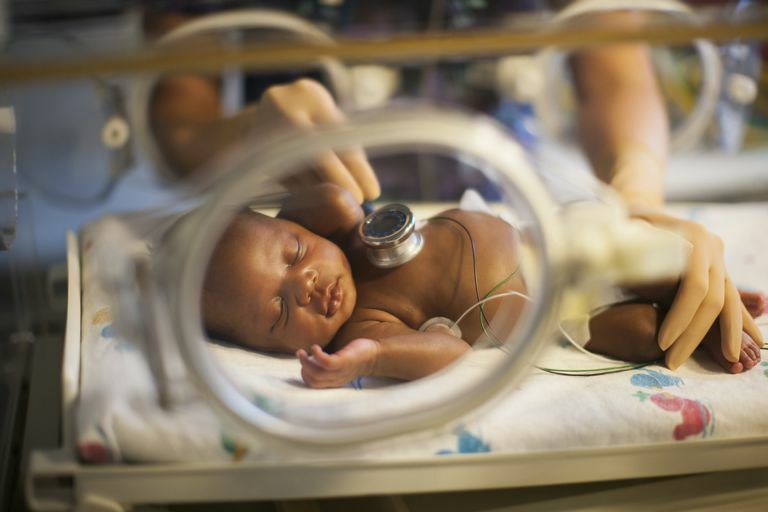 Infections in the preemie can affect their ability to breathe, gain weight, may increase their hospital stay and may lead to more chronic complications. It is important to know that with the proper steps and knowledge, we can prevent some of these infections and can make a huge difference in the overall health and outcome of the premature baby. Because of their decreased immune system and overall immaturity, a premature baby can develop an infection in almost any part of the body. The most common are in the blood (called sepsis), in the lungs, the brain (pneumonia) and spinal cord (meningitis), the skin, or the kidneys, bladder (urinary tract infection-UTI), or intestines (NEC). Shortly after birth, all babies acquire two types of germs, some healthy, and some potentially harmful bacteria. The healthy bacteria help keep the harmful in check. Good bacteria help aid in digestion. Sometimes, for the preemie, this complex system becomes imbalanced which can lead to problems and infection. The skin is the first line of defense. In a premature baby, the skin is fragile and may undergo frequent medical procedures such as IV starts, injections, and blood testing. This can be a portal for infections to enter the premature baby’s system. Because infection itself can be a cause of premature birth, a preemie may have been exposed to and acquire an infection in utero when bacteria or a virus is transmitted from the mother’s blood through the placenta and umbilical cord to the baby. They can also develop infections from exposure in their environment, after days or weeks within the NICU. Infections are caused by one of three kinds of microorganisms; bacteria, viruses, or fungi. Bacteria are tiny single cells found in the environment, on the skin, and in the (GI) gastrointestinal tract. A medication called antibiotics is used to treat infections caused by bacteria. Ampicillin and Gentamicin are two of the more common antibiotics that are used in the NICU. Viruses are organisms that are smaller than bacteria and are not susceptible to antibiotics. There is medication available called antivirals that help with some forms of bacteria causing infection. Fungi or more commonly known as yeast is frequently found in the GI tract and on the skin and can be the cause of some life-threatening infections of the blood. Medications called antifungals are used in the treatment of fungal infections. It may be difficult to tell if a preemie is developing an infection. Some of the signs may include: pale or mottled skin, a slower than normal heart rate, periods of apnea (pauses in breathing), and inability to maintain a stable body temperature; either too high or too low. The baby may have a poor muscle tone or be floppy and may have difficulty staying alert or may be fussy. The infant may also have trouble tolerating their feeds. There are some common tests that are performed in the NICU when a baby is showing signs of infection. These tests may also be done routinely to rule out any possibility of a potential problem developing. Blood may be drawn to check the baby’s white blood cell count. White blood cells' (WBC) main purpose in the body is to fight infections. A higher than normal or a lower than normal WBC count is a concern that the baby may be developing or has an infection. A type of WBC called a neutrophil is produced in the body in response to inflammation and infection. Neutrophils are immature WBCs and when an infection is present, the body will quickly release these immature cells to help fight off the invading microorganisms. Another blood test called a CRP or C-reactive protein test may be done. C-reactive protein is a substance that is released by the body in response to inflammation. An elevated CRP level may indicate the presence of an infection. A blood culture is a test that is done to try and grow a microorganism that may be present in the blood. This test is done to identify the exact bug that may be present and will help decide which antibiotic is appropriate to treat the infection. A chest X-ray is a diagnostic test to see the lungs to determine if there may be an infection such as pneumonia. A spinal tap or lumbar puncture (LP) is another test that may be performed to test for meningitis. In an LP, a small amount of cerebral spinal fluid (the fluid that circulates around the brain and spinal cord) is removed and tested for the presence of infection. If there is evidence of infection, the baby may be treated with antibiotics, IV fluids, oxygen, or even mechanical ventilation depending on the severity of the symptoms and the microorganism itself. Although some infections can be very serious, most will respond well to antibiotics. The earlier the infant is treated, the better the chance of successfully fighting the infection. The immune system of a premature baby will continue to be immature for the first few months of life and not function as well as that of a term newborn and therefore places them at greater risk for contracting infections, especially viral ones. Protecting your preemie while in the NICU and after discharge is very important. Hand washing and the use of hand sanitizer are two very important things you can do and encourage others who will be visiting or around your preemie to do the same. Limit the number of visitors and keep those away who have signs of a cold, cough or infection. Simple sicknesses in older kids and adults can be serious and even deadly to a premature baby. Stoll et al. Early onset neonatal sepsis: the burden of group B streptococcal and E. coli disease continues. Pediatrics. 2011: 127:817-826. Kaufman D, Fairchild KD. Clinical microbiology of bacterial and fungal sepsis in very-low-birth-weight infants. Clin Microbiol Rev. Jul 2004;17(3):638-80. What Does It Mean to Have a Preemie? What Health Problems Do Micro Preemies Have? Why Does My Baby Need a Spinal Tap?